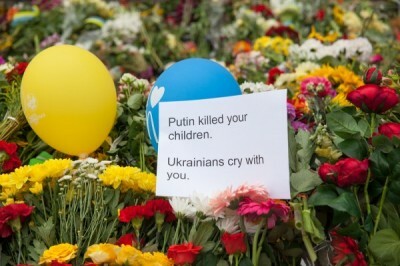 The downing of Malaysian Airlines flight MH 17 is a heinous crime – a crime of deliberate mass murder. Most, if not all global mass media as well as the Alternate media expressed similar sentiments and demanded that the perpetrators be brought to justice. Six weeks have passed since July 17, 2014 when the dastardly crime was committed and we are no nearer from the truth in so far as official pronouncements are concerned. In fact, lies and propaganda were intensified to mislead and divert public attention from the glaring irrefutable fact that the US and UK are ultimately responsible for the mass murder. This, we will show in due course below. First, we must expose the elaborate cover-up starting with the release of the Preliminary Report in Malaysia on the 10th of September, 2014. Why do I say that there is an internationally sanctioned cover-up? Let’s recap what the world leaders, with blood on their hands had to say on the 18th July, 2014. World leaders are demanding an international investigation into the downing of Malaysian Airlines flight MH17 over eastern Ukraine, which killed all 298 people on board. Calling for an immediate ceasefire in Ukraine, Obama demanded a credible investigation into the incident. “We’re going to make sure that truth gets out,” he said, having called the crash a “terrible tragedy” on Thursday evening. Earlier in the day, Prime Minister David Cameron had described the air disaster as “absolutely appalling, shocking [and] horrific” and called for those responsible “to be held to account” after chairing a meeting of the Government’s Cobra emergency committee. Prior to Obama’s statement on Friday afternoon, the United Nations (UN) Security Council backed a British-drafted statement calling for a “full, thorough and independent international investigation”, during an emergency meeting preceded by a moment’s silence for those killed in the crash. Earlier on Friday, White House spokesman Josh Earnest said it “is critical that there be a full, credible, and unimpeded international investigation as quickly as possible”. He told a news conference it was “vital that no evidence be tampered with in any way and that all potential evidence and remains at the crash site are undisturbed”. The Ukrainian Prime Minister Arseniy Yatsenyuk described the downing of the plane as an “international crime” and a “war against the world” as he called for an emergency meeting of the UN Security Council. “All lines have been crossed,” he added. To All Malaysians, especially the Malaysian government and the families of the victims, am I right in saying that in plain and simple English, the quoted passages above suggests that any independent investigation must lead to the identification of the perpetrators so that they would be prosecuted for their crimes. Nothing short of a definitive finding of fact as to who is guilty of this crime is but a heinous cover-up of the mass murder! Any independent investigation must establish the perpetrators, the criminal liability and responsibility of any state, and if more than one state or entity are involved, to apportion such criminal liability. If any report that emanates from the present investigation falls short of this benchmark, it is nothing more than a white wash and a cover-up. The Malaysian Prime Minister and the Attorney-General have publicly declared and assured the Malaysian public and the world that the perpetrators would be prosecuted for the crime. Nothing less would suffice! What is most startling is that within hours of the crash, a global propaganda campaign was mounted against Russia and President Putin which even influenced the Malaysian mass media which uncritically echoed this deceitful propaganda. For the record, Future Fast-Forward has been in the forefront in Malaysia exposing this propaganda and challenged the Malaysian mass media that if they cannot come up with irrefutable evidence showing that President Putin and Russia were responsible, they should shut up, bow in shame and apologise publicly to President Putin and Russia. Till to date, those in Malaysia responsible for the falsehoods have yet to issue any apology. . Leading members of the US regime, past and present have the audacity to point fingers at President Putin, the Russian Federation and the Ukrainian Resistance to the Kievw Junta as being responsible for this heinous crime. US senator John McCain also warned that there will be “hell to pay” if the Russian military or separatists are deemed to have had any involvement in the ‘incident’. In a television interview, the former US Secretary of State Hillary Clinton suggested the plane could have been shot by Russian-backed separatists, and said action was needed to “put [Vladimir] Putin on notice that he has gone too far and we are not going to stand idly by”. These two war criminals have to date nothing to show for their accusations. But, let us give them the benefit of doubt that they do have the evidence. In the circumstances, these two war criminals together with President Obama and Secretary of State John Kerry should (and they have the means and capabilities) to set up a parallel “independent investigation” to evaluate their dastardly accusations against President Putin and Russia. Justice demands that if these war criminals have such irrefutable evidence, they owe the world a duty to disclose the evidence and come clean that they are in no way involved in this heinous crime and bring those involved to justice since they have demanded accountability. Having demanded accountability from others, it is only right that they account to the world and the families of the victims for their blatant accusations and assist Malaysia in prosecuting the criminals responsible for this heinous crime. But, the opposite is the case. When Russia came out with evidence that the plane was tailed by Ukrainian fighter planes and MH17 was diverted and that at the critical moment of the downing of MH17, an American satellite was monitoring the entire area, the global mass media controlled by the Zionist Anglo-American establishment fell silent. How very convenient. Given the above circumstances, one would have thought that the current so-called independent investigation headed by the Netherlands would have as its primary objective to identify the perpetrators and the country responsible for this heinous crime, given the fact that members of the US regime, past and present (as quoted above) have accused President Putin and therefore the evidence in support are allegedly available it should not be a problem for this investigation to proceed accordingly. Wrong!!!! The powers that be have decided otherwise and have used a particular provision in the enabling international convention to avoid this responsibility. To avoid any misunderstanding, let me state here categorically that there is absolutely no evidence of any culpability on the part of President Putin, Russia and/or the Ukrainian Resistance. On the contrary, the evidence points decisively towards the Kiev Junta installed by the US, UK and NATO. It follows that a massive cover-up is needed. The cover-up is needed because if the truth is out that the US, UK and NATO together with the Kiev Junta are involved in this mass murder, the entire pretext for a war against Russia and thereafter the entire Eurasia Theatre would unravel and the blowback would be such that Obama may well be impeached following demands from the American people. David Cameron would have to resign forthwith which would accelerate the secession of Scotland from the “United Kingdom” and the dreams of the War Party of a “New Eastern Front” with Poland as the springboard would collapse immediately. So what is this provision that allows the perpetrators with the connivance of the Netherlands to avoid being investigated? I am not stating this with hindsight as I am on record in my interviews and articles that I have written as well as emails sent out, that I have held back my investigations and analyses so as to give these criminals enough rope to hang themselves for in the process of covering-up, they would by their actions show to the world their complicity. I have written records and witnesses to the above assertion and I dare challenge anyone to contradict me on this assertion. The above cited provision is an insult to the victims and the families of the victims. This is a mass murder. It is not an accident. It is also not a mere incident that could be prevented in the future. War criminals and states that commit war crimes such as US, UK, France etc. have been committing such crimes in the past and have not been brought to account in any international tribunal. Only in Malaysia, in the present century, have the courage of its conviction to convict Bush, Blair etc. for their war crimes in Iraq and the rump state of Israel for the war crimes and genocide against the Palestinians! Shame to Secretary of State, John Kerry! Shame to Prime Minister David Cameron! Shame to former Secretary of State, Hillary Clinton! Shame to Senator John McCain! How much more blood do they wish to be on their hands? Have no illusions, for there will be a massive blowback for their connivance and conspiracy to commit this heinous crime and for the cover-up. The mere thought (which was previously dismissed as a fanciful dream) of Scotland seceding has sent shock waves to the ruling war party in England. It was a three-hundred-year myth that Scotland and Wales needed England to survive. The Scots and the Welsh fell for it hook, line and sinker but no more. The Empire is dead, and there will be no longer the refrain, “the King is dead, long live the King!” It is dead for good, even if in the event the Scots change their minds and vote to remain in the UK. The writing is on the wall. Obama calls for the “dethronement of the „King Dollar‟ ”, the American Empire is in its death throes! City of London to fight and die for “Mother England” for she had never forgiven America for the insult and humiliation of losing the “Imperial Crown of America”, the most prized possession of Mother England. Break free from such clutches! The people of America must help Malaysia and Malaysians to expose this heinous crime and by so doing we would together prevent a potential war against Russia and thereafter against Eurasia. Americans must learn from their recent experience. Have you not fought enough wars? How many thousands of your young men and women must die for another nation’s interest?